Hi, I am interested in your 1935 Ford Model 48 (stock #4960-CHA) listed on Autotrader for $41,995. I'd like to get more information about this vehicle and confirm its availability. 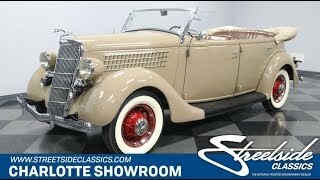 If you like the iconic look of the late 30s Fords, smooth flathead V8 power, and sporty roofline, then this restored 1935 Ford Model 48 Phaeton is just waiting for you to drive it home. History has an interesting way of making you appreciate a classic like this. The phaeton body style has a thin roofline opening up the car even with the top in place. That gives this American classic a very European feel. It was far from the most expensive car Ford offered in 1935, but today it has a great sporty profile that keeps it especially in-demand. This pre-war Ford has gone through a restoration in the 1980s and 1990s, and it has been treated with proper respect since. The excellence is seen in much more than the way the tan paint looks so period-correct, or how the red pinstripe nicely matches the wire wheels. To understand the full quality, just look at how all of the 80+ year-old steel retains its sleek lines, or how the doors can still easily be open and shut with confidence. All the details are right on this one, including the waterfall chrome grille, etched chrome bumpers with center dip curve, whitewalls, and even the Ford V8 hubcaps. And the cool, sleek, greyhound hood ornament that gives the premium image this car deserves. The gorgeous condition of brown interior is another sign of the careful restoration. The comfortable rows of bench seats look as inviting as you favorite easy chair. A beautiful banjo-style steering wheel, big round gauges with a gorgeous period look, and etched side wind deflectors all help with the upscale feel. As you look over all the details, you see a few of the right subtle upgrades, like a SW fuel gauge and seatbelts. You begin to realize this is more than a parade car thats a genuinely comfortable vintage cruiser. Everyone from outlaws and enthusiasts love Fords awesome 221 cubic inch flathead V8. The tidy engine bay looks quite authentic, and theres even documentation that suggests this is the original motor. More importantly, these V8s gave Ford an unbeatable reputation of a powerful personality that had a masterful amount of torque on tap. It only gets better on this example with a few subtle upgrades like dual Stromberg carbs and a glasspack-style dual exhaust. It means the V8 delivers extra power and a stronger note of that unbeatable Flathead soundtrack. The three-speed manual transmission shifts easily with light clutch action, and there were even hydraulic brakes added for better usability. Complete with maintenance records, this is the distinct phaeton that was made to enjoy on the road. So if you love driving you classics, and having all eyes on you, call today!